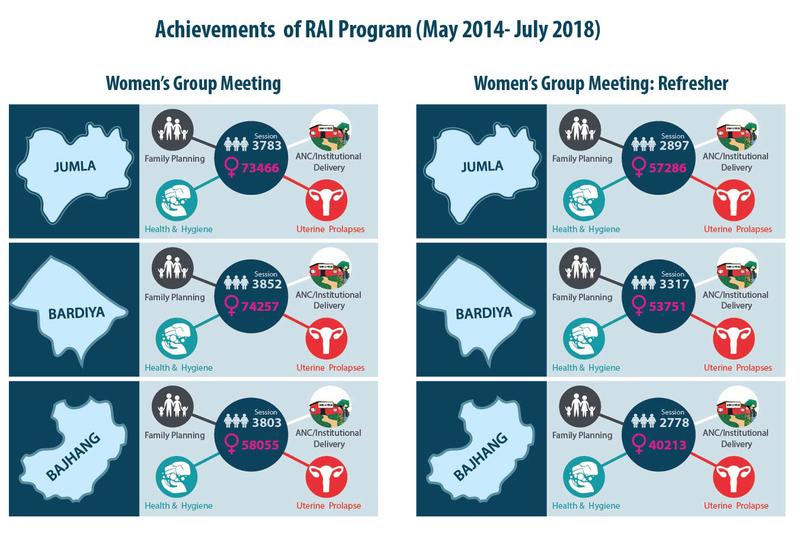 In 2014, as part of the GGMS project, CRS through its promising community-based initiative, RAI has been promoting and creating demand for FP, MCH services amidst the rural communities, in hard to reach districts of Jumla, Bardiya and Bajhang. At the core of this promising community initiative are the community based change agents (CCAs), who are local women, trained to conduct health promotion in their VDCs, disseminate important MCH messages to community women, and also encourage them to adopt their preferred choice of FP method. The main messages disseminated by the CCAs are on: FP, importance of antenatal check-up/ institutional delivery, health and hygiene, prevention of uterine prolapse. With guidance and oversight of the field team which includes the District Coordinators and the Social Mobilizers, the CCAs play a key role in health promotion by engaging the community women in interactive and participatory ‘women’s group meetings’ in the VDCs, reaching them with key BCC messages and empowering them to make informed FP decisions. CCAs are selected on certain specific criteria such as their literacy levels and their influence and reputation in the communities. The selected CCA usually represent the predominant group in the community (for instance if the members are primarily Dalit, then the CCA should be from that community). 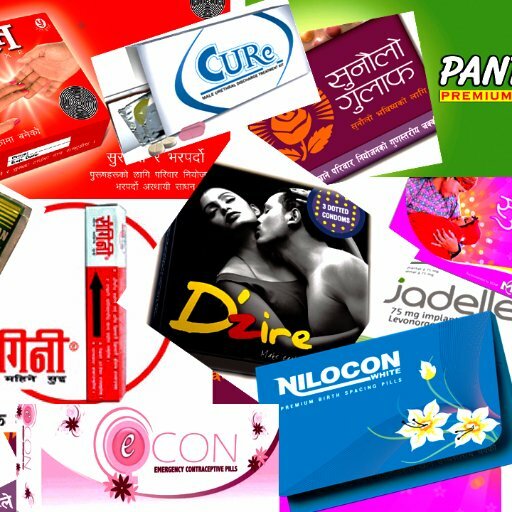 Apart from women group meetings, RAI also trains NTOs on HIV prevention and condom usage, thereby motivating them to stock condoms. Keeping in mind the evolving dynamic situation in these hard to reach areas, RAI will always remain highly flexible with unwavering focus and commitment to achieving its key objectives and the national development goals. The next steps for RAI include geographic expansion of the program to other districts with low CPR, creating formal tracking systems for referrals made to the health facilities to determine actual number of referral visits, and creating strong linkages with service delivery initiatives. This expansion shall be processed in close consultation with USAID, SHOPS Plus and Family Health Division. RAI will continue to look for ways to enhance its impact and will also look for effective ways to communicate key messages to the male community members who often are the decision makers in these communities. 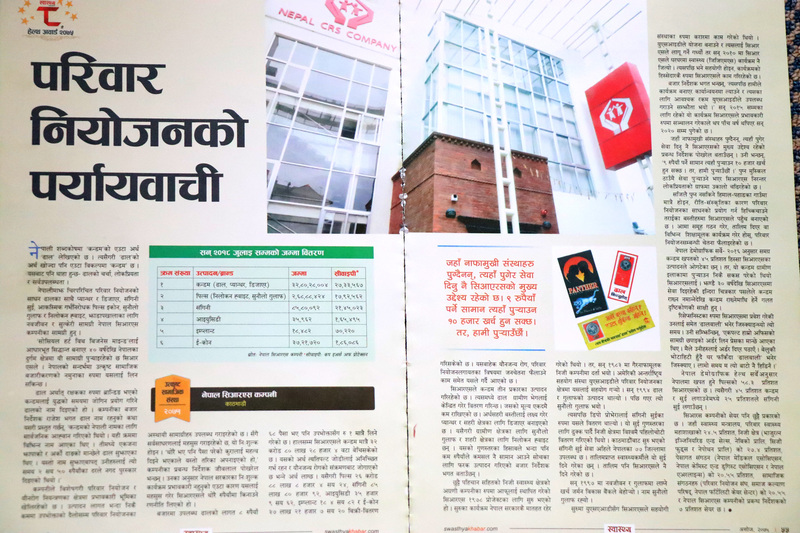 Building on RAI’s success is working with CCAs, in the future the program may also consider a rural retailer model, whereby CCAs could be trained as rural retailers. This is in line with the needs of rural communities in Nepal, and CRS’s priority to expand and deepen its reach in rural communities. CRS could explore the feasibility of training the CCAs as rural entrepreneurs, and designing a product basket that would fit with rural health priorities and consumer demand as well as provide a viable income for rural entrepreneurs/CCAs willing to work 25- 30 hours per week. In this scenario, the VHCs will not be limited to just creating awareness about public health issues and conducting health promotion, but will also sell related products to consumers in their villages to help sustain themselves and their families.